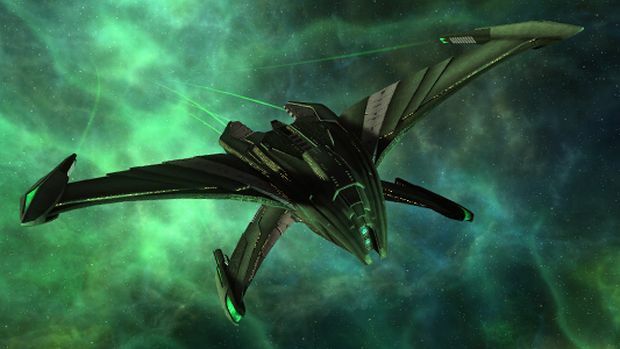 Star Trek Online is less than a week out from its latest big free content update, Legacy of Romulus, which, as may be expected, will introduce the playable Romulan Republic faction and a new line of Romulan Warbirds to captain. A number of those warbirds are, of course, available for pre-purchase in the game's "Legacy Pack" bundles, and now Cryptic are adding a few more items to sweeten the deal. The big addition is of the beastly ship above, the Haakona-class Advanced Warbird. It's a premium version of the top-tier Ha'pax-class Advanced Warbird, and comes with a special gimmick: It can split into two ships, each with unique qualities. The second item should appeal to old-school fans: Romulan uniforms as seen in the classic Star Trek series. Come May 21st, expect a few Romulans wrapped in hilarious magenta bath towels, wearing helmets that look like pistachio-shells. Just the way I like my "Womulans"! Check out pictures of both in the gallery. Though most of the bundle will be available piecemeal at launch, for its steep $125 price tag the Legacy Pack does offer significant value. Bought separately, the items in the pack would cost about $212, according to Cryptic's math. Sounds like a decent deal, if you're the type of player who anticipates spending a considerable amount on the game over time. Speaking of spending and time, I've been spending time with Legacy of Romulus on the public test servers, and came away almost wowed (pun not intended). Look forward to my impressions soon!